Eric Yellin, from Other Voice (click here), shared this thought with us, the Ecumenical Accompaniers of Group 38, on 26 January 2011. We were on a bus during our midterm orientation, touring the Israeli community of Sderot. 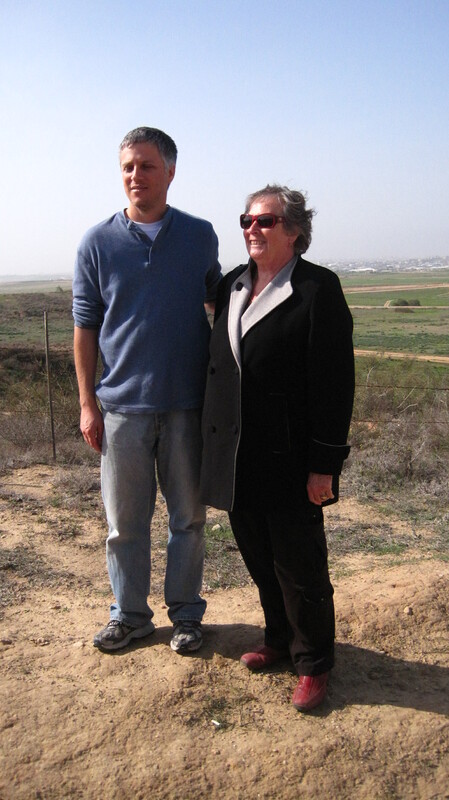 From the outskirts of Sderot, you can see the Gaza Strip, one of the Palestinian territories controlled by Israel. Ronni Keidar, an Other-Voice member who lives in an Israeli community located immediately beside Gaza, also joined us on that sunny day in January. As Eric said, Sderot has become one of the most protected towns in the whole world with its shelters and shielded buildings. Constructing all of these ‘safe’ places is a very expensive venture. The bus stops are specially built to serve as shelters from rockets; steel shields are being built over school buildings; and safe rooms are being added to apartment buildings. 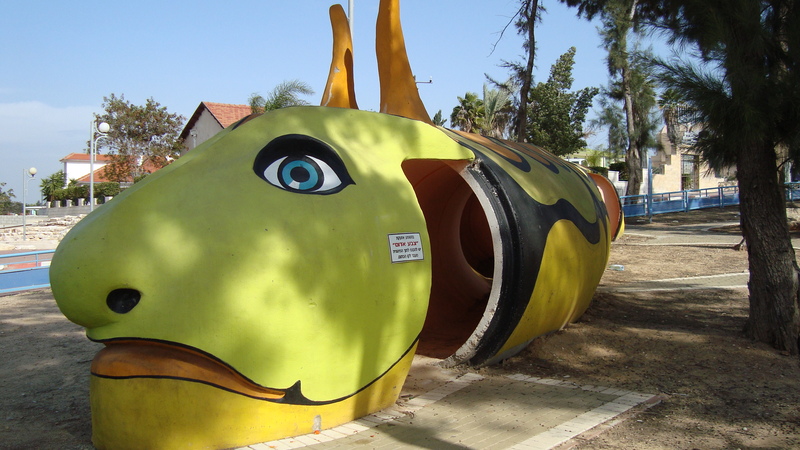 The sign on this playground rocket shelter (in the shape of a caterpillar) reads: “When you hear the ‘colour red’ go into the safe space beyond the orange line”. According to the Other-Voice website, this is a non-partisan, grassroots group seeking “a civil solution in the Sderot-Gaza region”. They have “no political aspirations. We are citizens of the Sderot region and the Gaza region. We are interested in finding creative ways of hearing a new voice from the region and for promoting hope and non-violent actions for the benefit of the locals who live here in Sderot and in the Gaza Strip” (Click here). To me, Other-Voice members seem to be trying to maintain a human connection, regardless of the political ‘chess games’ being played in their midst. What if for a day or a week or two weeks, we, the people who live on this planet, agreed to sit down and talk with one another? Not as politicians, but as people. What if the ugly turnstiles in the Israeli Separation Wall/Barrier between Israel and the West Bank and the gates at the crossings between Israel and the Gaza Strip were suddenly swung open? What if the fishing boats of Gaza were free to come and go in the Mediterranean waters and ordinary citizens from across the water and around the globe were free to visit? What if the money spent on the appearance of security were re-directed to supporting clean water, sanitation, and holistic diets…that would support child, youth, and lifelong health? If you are interested in the current efforts of global citizens, including Canadians, who are seeking to end the Israeli occupation of Palestine and who are standing for a just peace in the shape of Freedom Flotilla II – Stay Human, be sure to watch the following website over the next few days (click here) regarding the Canadian Boat to Gaza, The Tahrir (Arabic for “liberation”). Some of you may have heard Michael Enright’s recent interview (19 June 2011) with Amira Hass on CBC Radio (clicke here). As described at that CBC Radio webpage, Amira Hass “is the only Jewish Israeli reporting from the occupied territories. She is a correspondent for the Israeli newspaper Haaretz.” Recall my recent postings about access to water – Amira Hass comments on this issue early in the CBC interview. Amira Hass is one of the global citizens travelling on the Canadian Boat to Gaza, The Tahrir. For some of her recent postings from Greece, click here. 1 July 2011 (just posted at Haaretz) – click here. 28 June 2011 – click here. 26 June 2011 – click here. 6 June 2011 – click here. 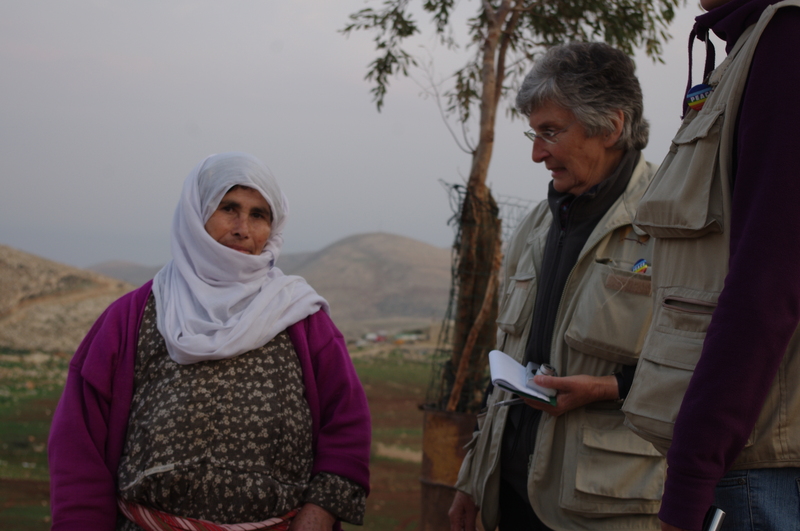 Here is a link to another recent interview with Amira Hass (29 June 2011) – click here. Water and Sanitation crisis in Gaza – click here. Canadian Boat to Gaza – article about – click here. Irish Foreign Minister’s statement – click here. The Palestinian population in the Jordan Valley has consistently faced discriminatory Israeli policies relating to planning, building, and access to land and water. Over 94 percent of building permit applications submitted by Palestinians to the Israeli authorities between 2000 and September 2007 were rejected. The Jordan Valley is classified by the Israeli government as part of Area C. Israel has both civil and security authority over Area C of the West Bank and the estimated 150,000 Palestinians living there. Much of the Jordan Valley’s land has been declared a “closed military zone” by the Israeli army or has been illegally annexed into Israeli settlements, effectively turning the Jordan Valley into an Israeli enclave within the occupied Palestinian territory (oPt), and attempts by the authorities to remove the Palestinian population from Area C appear to be escalating. On 21 June, the Israeli army destroyed 29 homes and other properties in the Bedouin hamlet of Hadidiya in the Jordan Valley, leaving 11 children and 16 adults without homes. On 21 June, five structures (two homes, a shared kitchen and two animal shelters) were demolished in Khirbet Yarza, in the northern Jordan Valley, affecting 30 people, of which 8 are children. o For more information read this article or watch this video. On 14 June 2001, demolitions were carried out in Al-Fasayal, in the southern Jordan Valley, which, according to Jordan Valley Solidarity, displaced an estimated 103 people, including 64 children. Earlier this month, the Israeli army destroyed a tent and three animal shelters in Hadidiya, displacing a family of 10 on grounds that they had relocated their home one hundred meters from its original site to a closed military area. The International Court of Justice has stated that the Fourth Geneva Convention for the Protection of Civilian persons in Times of War applies to the oPt. The systematic policy of house demolitions carried out against Palestinian residents contravenes Article 53 of the Fourth Geneva Convention which forbids “any destruction by the Occupying Power of real or personal property belonging individually or collectively to private persons” except where such destruction is rendered “absolutely necessary by military operations”. Share this information with your networks. Inform your representative in parliament about what is happening in the Jordan Valley. Contact the Israeli Ambassador in your country to condemn the acts above and to call for all demolition and eviction orders against Palestinians in the West Bank to be cancelled immediately. Thirsting for Peace in Palestine and Israel – Water is a human right. This posting is the third in a series regarding the water and sanitation crisis in the Israeli government’s occupation of the Palestinian territories, particularly East Jerusalem and the West Bank. For more information about this crisis, click here. 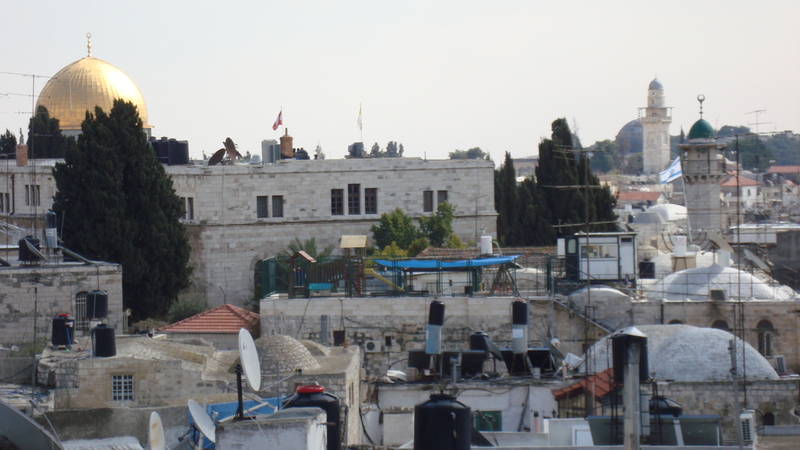 From a distance in the West Bank and in East Jerusalem, distinguishing settlements and Palestinian communities is relatively easy, by the presence of black water tanks on Palestinian rooftops. Palestinians do not know for certain when the water will flow into their homes each week. Israeli authorities are requiring that if the West Bank Palestinians choose to build a water network, they must connect the Israeli settlements to that network. However, these settlements are illegal. This population transfer is a war crime according to Article 49(6) of the Fourth Geneva Convention (Click here and here). 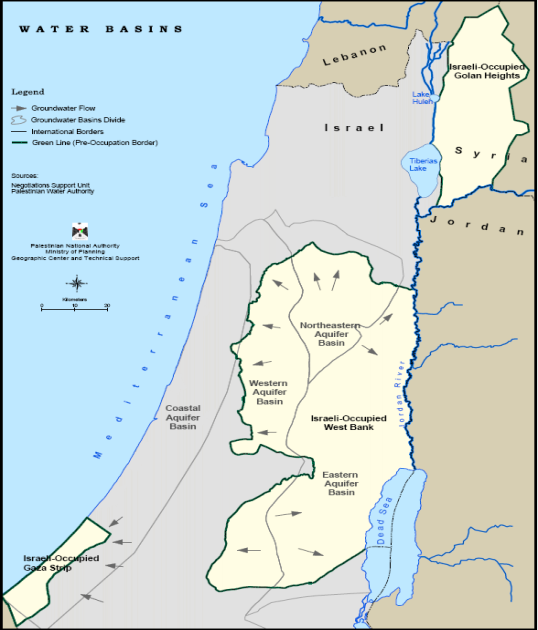 According to Article 43 of the Hague Convention, “Israel, as an occupying power over both the West Bank and the Gaza Strip, has the ultimate responsibility to as far as possible ensure that public order and safety are upheld in the territory it occupies, including securing the welfare of the population (article 43, Hague Convention)” (Diakonia, 30 Apr. 2011). This environmental structural violence (Zaru, 2008) has not been making the news headlines. Yet, literally, Palestinian society has been thirsting for peace. Many Israelis may be unaware of this effect of their government’s policies. Israeli settlers travel on settler-only roads and other Israelis have the Separation Wall/Barrier blocking their view. Water is a critical point of discussion in the Israeli-Palestinian conflict. Water is one of the “permanent status issues – borders, Jerusalem, settlements, refugees and water” (UN General Assembly media release, 12 Feb. 2010). I write from a place, Alberta, Canada, that is just beginning to wake up to a water crisis. We, locally and globally, need to learn a new reality that water is a geo-political issue, a human-rights issue, an economic-justice issue, an issue tied to war and peace, and an issue related to respecting nature. We all need water for physical reasons and spiritual reasons. This winter, at the height of evictions and demolitions of Palestinian homes by Israeli authorities in East Jerusalem, I was a tightly wound bundle of nerves. I had a very difficult time relaxing. But, I was the lucky one. 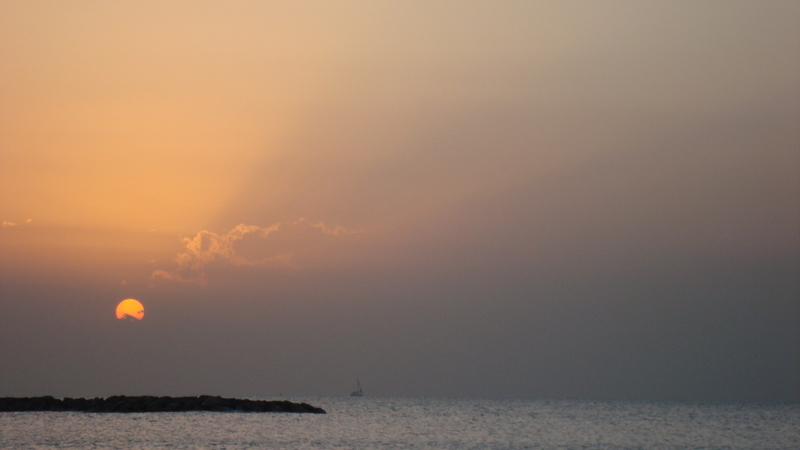 On my three days off, I could ‘go to the water’, to Tel Aviv in Israel, to the Mediterranean Sea. I just went and sat on rocks by the water. I watched. I listened. I breathed. I took off my boots and I walked in the water. Not everyone who is a tightly wound bundle of nerves in Palestine can do that. For those who live in what has been called, the “largest open-air prison in the world”, Gaza, they may more easily ‘go to the water’. But that water is increasingly contaminated. (See EWASH factsheet #1 here). We need to realize that the Israeli occupation of East Jerusalem, the West Bank, and Gaza is not only having a local impact. In terms of water, alone, this conflict is having international effects. Just think about how the water of the Mediterranean Sea is shared in that region of the world and flows into the Atlantic. Efforts to end the Israeli occupation of Palestine are particularly focused on the Mediterrean as I write given the efforts of the Freedom Flotilla II. Zaru, Jean. (2008). 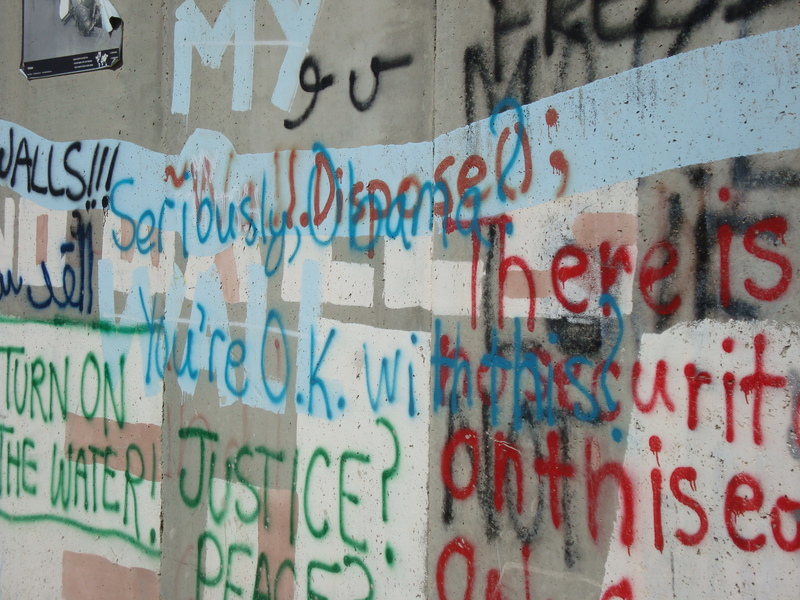 Occupied with Nonviolence: A Palestinian Woman Speaks. Foreword by Rosemary Radford Ruether. Minneapolis, MN: Fortress Press. 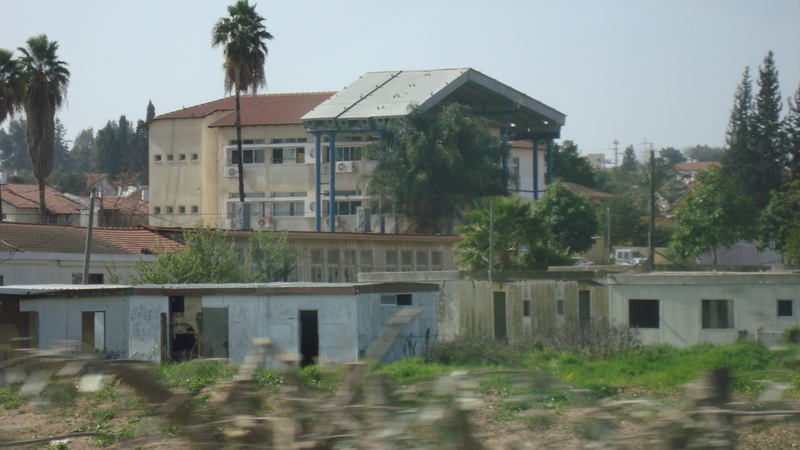 This posting, “Thirsting for Peace in Palestine and Israel – Water is a human right”, and the previous two postings on this blog are drawn from a spiritual gathering on 1 May 2011 at Southminster-Steinhauer United Church, Edmonton, Alberta, Canada. For an audio version of this series of postings, please click here. This posting is the second in a series regarding the water and sanitation crisis in the Israeli government’s occupation of the Palestinian territories, particularly East Jerusalem and the West Bank. For more information about this crisis, click here. This is the kind of news headline that is familiar. This is “direct violence”. Yet, this news story from the 2 January 2011 has stuck with me because of the image of the young man carrying a bottle…what was in that bottle? Bottles are everywhere in East Jerusalem and the West Bank, particularly plastic bottles that have been thrown away. Recycling and garbage removal in East Jerusalem is a service only provided to some parts of that society. On the other hand, re-use in East Jerusalem and the West Bank is evident in containers of every size storing water… And here is the link to this image of the young man with the bottle…That bottle brings to mind another type of violence, “structural violence”. Jean Zaru is calling out to the world, as are many other Palestinians and Israelis who are working toward ending the Israeli occupation of Palestine, with examples of this imbalance. One such example is the environmental structural violence around water. Early in our orientation as the 25 Ecumenical Accompaniers of Group 38, we were introduced to George Rishmawi. 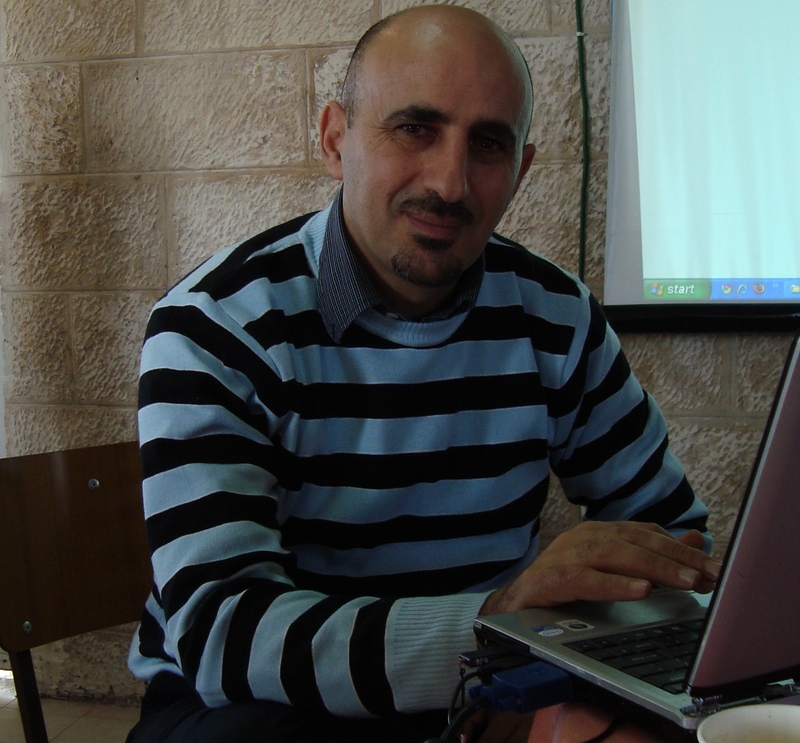 He is Palestinian, the Advocacy Officer with the Near East Council of Churches, and a member of the EWASH – Emergency Water and Sanitation Hygiene – Advocacy Task Force (click here). EWASH has 31 international and local groups responding to the water and sanitation crisis in the occupied Palestinian territories. 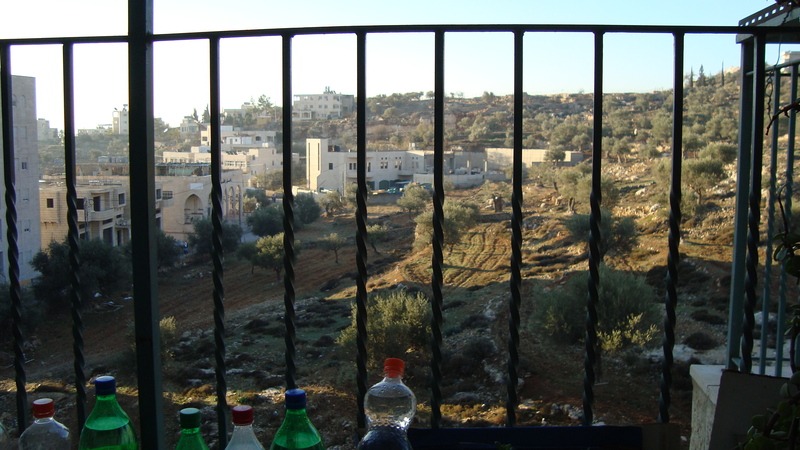 Rishmawi described to us that water is THE issue at the moment – it is a “tool of pressure” in the occupation, for as he said, being surrounded “by a wall, in a cage, without water, will kill a person”. Rishmawi described to us that Lake Hula used to serve as a natural filter of these rivers into the Sea of Galilee (Tiberias Lake). But Lake Hula has shrunk considerably as a result of water-intensive agriculture and military (nuclear) purposes in Israel. 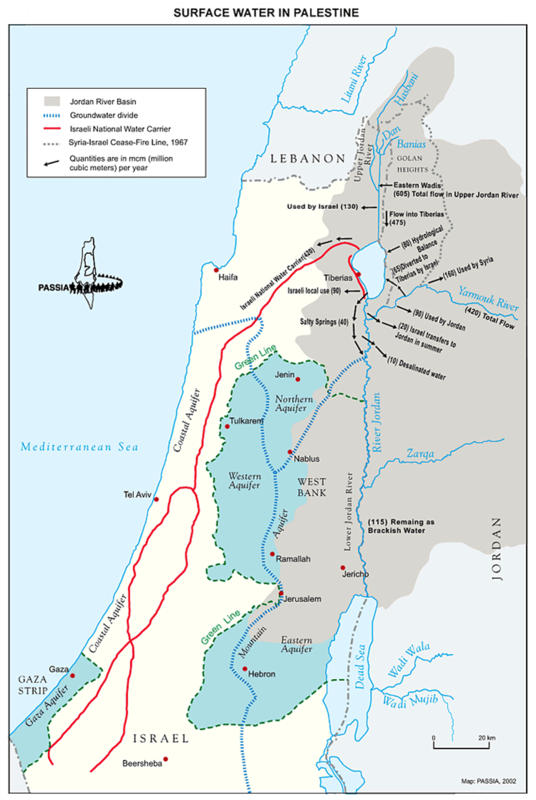 On this next map, the red line outlines the National Water Carrier drawing water from the Jordan River into Israel. Before 1948, over one billion cubic metres of water flowed per year in the River Jordan. Post 1948, only 40 million cubic metres of water flow and it also carries sewage and discharge from fish farms. The Sea of Galilee is shrinking in size. The Dead Sea is also shrinking and, as a result, has split into a number of smaller lakes. In addition, surface evaporation is an issue for the Dead Sea: 25 mm/24 hrs (Shehadeh, 2008, p. 122). According to George Rishmawi, in 1967 when Israel occupied East Jerusalem, the West Bank, and Gaza, “Israel secured control over all the ground water resources and issued military orders relating to water. For example: Military Order 98 (August 1967) transferred all authority over water resources to Israeli Military Command.” Permits were then required for developing water resources and infrastructure…including drilling wells and maintaining springs, cisterns, networks and reservoirs. “I see a beautiful view when I wake up in the early morning. When the sun rises, from my roof I see the Dead sea, gleaming in the dawn. And when the sun rises opposite the settlement of Maale Adumim – an Israeli settlement – I see it like a crocodile. And as I watch the sun rise, I say that maybe there will be a promise of a better tomorrow, and when I see the Wall, winding around us, I feel an acute pain, and I liken our life to a wrapped-around tin of sardines, and I think of the future of the young people. Will they find a tomorrow without tragedy and pain and siege, and will they be depressed? And this is the tragedy of the Palestinian people. Although I live in a place with a stunning view, the Wall spoils its beauty. Can you see how this is painful? Can you see the pain that the Palestinian people live in? This posting, “Thirsting for Peace – Environmental Structural Violence – Water”, and the previous and the next postings on this blog are drawn from a spiritual gathering on 1 May 2011 at Southminster-Steinhauer United Church, Edmonton, Alberta, Canada. For an audio version of this series of postings, please click here. Hamdan, Hikmat. (2010). “The Sea”. In Camden Abu Dis Friendship Association, Stories from our Mothers (meetings of British and Palestinian women). Edited by Nandita Dowson and Abdul Wahab Sabbah. Milton Keynes, UK: Lightning Source, p. 89. Shehadeh, Raja. (2008). Palestinian Walks: Notes on a Vanishing Landscape. London: Profile Books.